I spent my birthday locked in a big room with five of my friends at the “Escape from the Werewolf Village” in New York City. This was a one weekend only, traveling room escape event put on by one of the pioneers in the real life room escape world. I was damn excited. I have been obsessed with these room escapes, so much so that I wrote a primer on how to do them. Sadly, I found this event lacking in a number of significant ways. I’m going to break them down without giving away any significant spoilers from the game. Room escape puzzles are typically intimate events. A team of 2 – 12 people working in close quarters, physically interacting with one another and the room. This was a 90 person event with teams of 6 people. Most of the work happens at your own little table. I stood up once during the whole hour. There was a lack of ambiance at this event. Room escapes usually come with a palpable feel that comes from the environment. Escape from the Werewolf Village had all of the charm of a school assembly. The story is that you’re trying to figure out which 3 of 16 villagers are werewolves before time expires and you become werewolf chow. How you know there are 3 werewolves in the first place is a mystery. The game is themed on werewolves, but none of the puzzles have anything to do with the theme. At the start of the game, your team opens a manila envelope with a number of puzzles in it, and that’s basically what you will spend your time interacting with. They are reasonably challenging logic puzzles, but there’s no depth to them. The puzzles also provide clues that have nothing to do with the puzzles themselves. Everything is an abstraction. The puzzles bear more resemblance to an LSAT exam for law school admission than a game about saving your hide from werewolves. They were fun enough, but never once did they capture my imagination. I’ve done a few room escapes, and I lost one in Budapest, while still loving the game. In a real life room escape you either unlock the door and get out, or you don’t. I have never seen a puzzle that has a cloudy resolution. It just shouldn’t have been designed that way. When I look back on this puzzle, I can say confidently that I wouldn’t have enjoyed it any more if we had won. 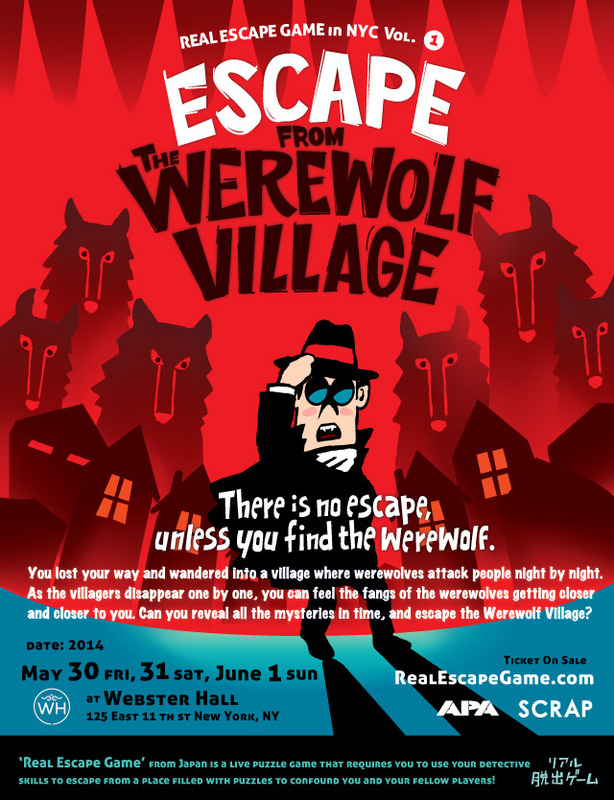 My big concern is that there were people in that room who were doing a room escape for the first time and think that Escape from the Werewolf Village is representative of all room escapes. If this were my first, I am not sure I’d have gone to a second one. A room escape should transport you into a story. Make you feel like you are part of something big and real. You should get lost in the details, and wander the puzzle with the enthusiasm of a child. Win or lose, you should walk away feeling like you had fun playing in someone else’s world of make-believe. Escape from the Werewolf Village fell very short of that. It never made me believe. It never made me feel like a detective. It never made me have fun. I love the effort from the creators, and I think it is possible to do a mass room escape, but this just misses the mark. I want to see room escapes flourish, but the quality needs to be there. The puzzles need to be compelling, and fair while being difficult.